Light up loved ones' lives—across town or the whole country—with 2 or more of these in-sync lamps. 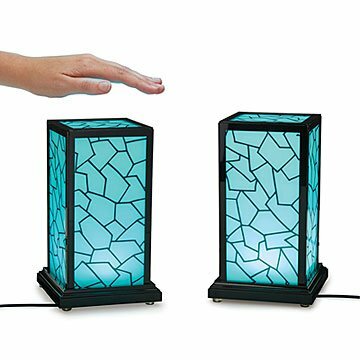 Light up a loved one's life—across town or across the country—with two or more of these in-sync lamps. When you turn one on with a simple touch of your hand, its mate emits the same ambient glow, no matter where it is and who is on the other end: Parent or grandparent, niece or nephew, or long-distance significant other. Each person sets up their lamp via Wi-Fi, then reaches out and touches the lamp whenever they want to let their loved one know they're thinking of them. With every touch, the lamp cycles through a rainbow of colors, one at a time. You can also assign each loved one a color so that when they tap their lamp, yours lights up with their special hue. Mix and match with the new mid-century design, too, if you like. Designed by John Harrison and Vanessa Whalen. Assembled in Kansas. Learn how to set up your lamp. Finally, visit the blog for a Q&A with John Harrison that touches on the beauty of code, the power of capacitive sensing, and much, much more. When John Harrison and Vanessa Whalen first met, John was Associate Professor of Violin at Wichita State University and Vanessa was a pianist accompanying his students. Instantly friends, they did not start dating until many years later. By then, John had developed a second career as an electrical and computer engineer and Vanessa was a psychotherapist in private practice. John proposed to Vanessa on Christmas morning 2014 and their first touch lamps were also gifted that year. The two built them in their basement to connect John's family members spread out across the US and Canada. John now works with nonprofits to assemble the lamps while contributing back to the community. By marrying Vanessa, John also gained two sons, Brendan and Sean. The family now enjoys a blended household of dogs, as well as a small school of goldfish. John and Vanessa also founded a startup which develops mobile apps for kids to help them learn about and manage their feelings. Visit the blog for a Q&A session with John that touches on the beauty of code, the power of capacitive sensing, and much, much more. Sold individually or in pairs (make your choice in the pull-down quantity menu). Requires power (100-240V AC) and WPA, WPA2, WEP or open Wi-Fi connection. Does not work with captive portals such as found at public Wi-Fi locations or with WPA Enterprise used in some academic and corporate environments. Requires a 2.4 GHz connection, does not work with 5 GHz connection. Lamp illumination timer has a default setting to fade off in 1.5 hours but, can be set to fade off in 1/2 hour, 1.5 hours, 8 hours or 24 hours. One-step set-up requires access to your home router. Customers can order lamps individually and sync them the same way they'd sync lamps ordered in a set. I love this purchase! Best gift I've ever given. Easy set up and a special way to let your loved ones that aren't located close to you know you are there and thinking about them. Especially great when we are in different time zones! Love it! My parents, cousin and I live in three separate US states. We are all in the same "group" on the lamp network and reach out daily via the touch lamp. It is a great way to stay connected and just say "hi, I'm thinking of you". Perfect for the long distance! My best friend gave me one for my birthday. So nice to see it light up and know she's thinking about me from all the way across the country. Need to re-name it the "Smile Maker"
Use it to stay connected to my son in Ohio. It brings a big smile to both of our faces whenever we enter the room and it is lit up. Just gives me a warm and happy feeling. Absolutely Love It!! First one worked great. then it failed. got 2 replacements. both light up when I touch the side reaching for something. 2nd one isn't as bad as first replacement. wish it didn't, but oh well. Hope it lasts FOREVER! I use it at home while my boyfriend is out 5000 miles away. Set up was SUPER easy and when I set up my online account, it connected it to my boyfriends lamp. If using for a couple, I would recommend getting the pair of lamps! Makes me feel special when my other half changes the lamp and I see it. It's too bright for me to use in the bedroom; I love it in the office though. I also wish there was a way the 2 lamps could've been synced from the manufacturer. I was able to figure it out and am not sure if my friend can, and he may not admit it. A simple touch does it all. Love everything from it. I received this as a birthday gift from my best friend who lives in DC & I live in AL. It is a great way to let the other know they are on your mind. Very unique and now one of my favorite pieces in the house. We love using this lamp to let my parents know they're on our mind and that we miss them. Being 1,200 miles apart, I know they often feel lonely with their children and grandchildren so far away. My mom cried when I explained to her what the lamp does and is for and she said it's the most thoughtful gift she's ever received.